Must ask for "Holiday Special" on first call! 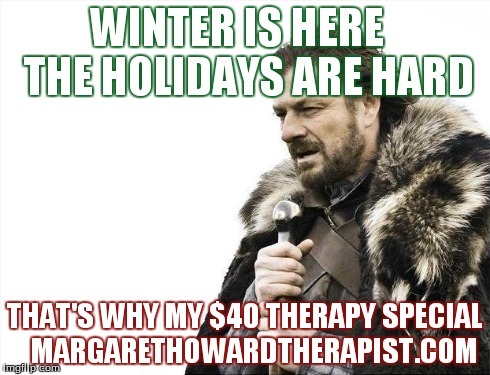 Because the holidays can be so hard, for so many, I've decided to offer a holiday special. $35 when you buy 6 sessions in advance. First session must be paid in advance of first appointment. Special price only applies to appointments before January 9. Free 10 minute phone consultation. Limit 6 sessions at the special price. Family, lack of family, or the deep deep cold and darkness of winter. Whatever the challenge I can support you through it. Call or write today while appointments are still available. And please remember, the caller MUST ask for the "Holiday Speical" on the first call to qualify!